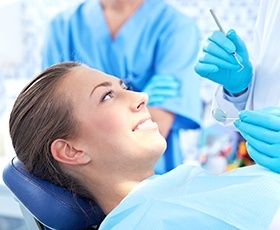 Dental Checkups & Cleanings in Washington, DC. People of all ages should be scheduling at least two professional checkups and cleanings with their chosen dental office every year, or one every six months. If there are extenuating circumstances, such as the presence of gum disease or excessive sensitivity to tooth decay, the dentists at Davidson Dental Associates may recommend more frequent visits in order to give your oral health the diligent support it needs. These important appointments will give us the ability to pinpoint dental problems at their earliest stages and provide essential treatment, potentially saving you serious time and cost down the road. If you’re ready to visit our Washington, D.C. location, please contact us today! What Will Happen During My Dental Checkup? 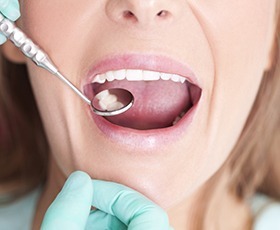 One of our dentists will take the time to examine every part of your oral health – this includes the surface of each tooth, the gum tissue, the jaw, your resting bite, any existing restorations like crowns and fillings, and more. We will perform an oral cancer screening, as well as comprehensive X-rays that will reveal areas hidden from the naked eye. This evaluation is meant to be truly comprehensive so that we will fully understand any problems the patient is facing and how we can assist them. The last step is to go over recommended services and determine the best treatment plan for the patient’s budget, schedule, and personal preferences. What Will Happen During My Dental Cleaning? Our talented hygienists will begin this process by using a scaler to rid your smile of decay-causing plaque and tartar, focusing on the enamel surfaces, the gum line, and between the teeth. Once these harmful substances are gone, a thorough cleaning with toothpaste and expert flossing will follow. Any minor staining will be removed as well. Once we’re done, your smile should feel refreshed and nicely polished.